Cats and Carcassonne are a winning combination! Hello! 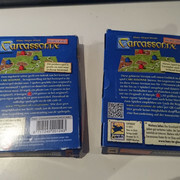 I am looking to purchase the Carcassonne: Demo-Spiel set for my collection. If anyone has this collectible, please be sure to contact me! I should be able to help you here - but you shouldn't be buying them; they're Hans Im Glueck demo boxes. If others want them, let me know now; I'll see if there's a way for you to get them, based on number required. Sure, that sounds great! Feel free to send me a message about it! I would love a demo set. If it’s available:). I think that just one for myself is plenty, but if it is possible to have a second one, that would be appreciated. What does a demo set contain? I believe it has 20 small tiles (travel edition sized), and 8 meeples (4 red and 4 blue). The rules are printed on the inside of the little box it came it. Oh I thought at first you were searching for the spiel tiles, has any one a picture of it? Actually, I am searching for the 2014 Spiel Tile, as it is the last one that I need for my collection. However, I am also searching for the demo set as mentioned in this post. If you have the 2014 Spiel Tile and would like to sell it to me, please feel free to send me a private message. Sure, these are the 2 versions i've seen so far. I thought they were only in German and Dutch, but it seems more versions exist! That is indeed a cool addition to add to the Carcassonne for 2 . I only knew the travel sized old edition. You have 2 versions Willem.... No wonder you don't want Mrs Willem to know the value of the collection! Another post could be 'What percentage of your collection has been used'?